Catalonia regional authorities say 14 people have been hurt and six arrested after separatists clashed violently with police on Saturday. The regional police force said one of its officers was injured, although it was not immediately clear if the officer was counted among the 14 people who needed medical attention. Medical authorities say three people were taken to the hospital while the others were treated on site. Catalan separatists clashed several times with police, tossing colored powder before charging police lines, in downtown Barcelona. The separatists were protesting a march being held by supporters of Spain’s national police. Catalan regional police say that they have made two arrests after Catalan separatists clashed with police in downtown Barcelona. Catalan police have told The Associated Press that both people were arrested on charges of acting violently against police officers. Catalan separatists clashed several times, tossing colored powder before charging police lines, in downtown Barcelona on Saturday. The separatists were protesting a march being held by supporters of Spain’s national police. 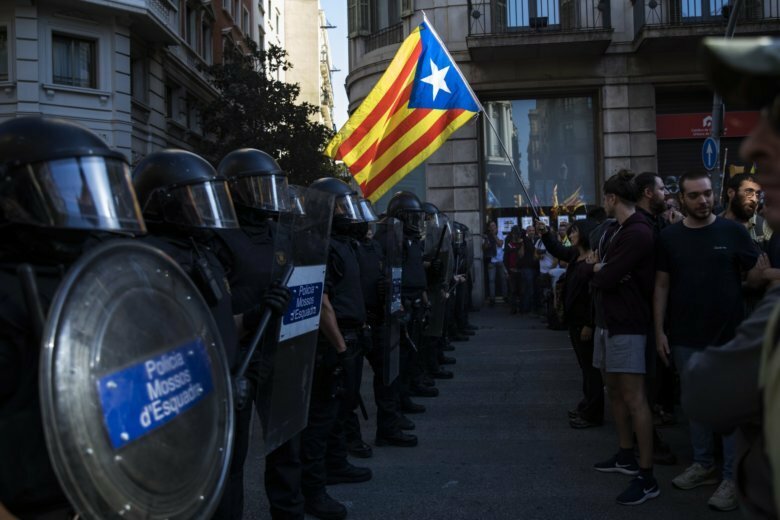 The confrontations occurred two days before the anniversary of an illegal referendum on Catalonia’s secession that ended in raids by Spain’s nationwide police forces. Catalan separatists have clashed again with local police in Barcelona as they protest a march in support of Spanish police. Local Catalan police have had to intervene several times to keep hundreds of separatists from approaching Barcelona’s main city square where the Spanish police marchers have gathered. The separatists are shouting “get out of here fascists!” across the police line at the marchers, many of whom are carrying Spanish flags. Earlier on Saturday, the separatist protesters tossed colored dust at Catalan police, who used batons to keep them back when they tried to approach the other march at its starting point in a nearby street. Police have clashed with a group of Catalan separatists in downtown Barcelona who have gathered to protest another march by Spanish police demanding better pay. Local Catalan police intervened Saturday to form a barrier when a separatist threw purple paint on a man who was part of the march in support of Spanish police. Agents used batons to push back the oncoming separatists and keep apart the opposing groups. Tensions are running high in Spain’s northeastern Catalonia ahead of Monday’s anniversary of an illegal referendum on independence held by regional lawmakers. The referendum was marred when Spanish national police and Civil Guard officers clashed with voters, injuring hundreds.